November 22nd, 2017 | Moving For Work, Moving Guides & Checklists, Moving Tips. If you’re in the military, your relocation may include a host of perks and benefits to make your move easier on you and your wallet. After your military move is complete, the IRS allows you to deduct many moving expenses as long as your move was necessary for your armed services position. Make the most of the benefits and protections afforded to armed service members by educating yourself and planning ahead. It’s never easy to uproot an established household, but the government has taken steps to make it less complicated for military members. Relocating is easier when you follow the tips below. 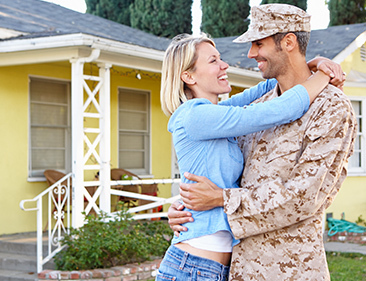 In order to take advantage of your military status during your move, you need to have proof of everything. You need proof of your military service, your deployment record, and your active duty status. You also need a copy of the most recent orders for a permanent change of station (PCS). In some cases, you’ll receive a disbursement if you choose to do the move yourself. In other cases, the military unit in your area has a contract with a moving service already in place to handle relocations. Your move will be coordinated through that company. Sometimes, you’ll have to pay moving costs up front, which you can deduct from your income taxes under most PCS conditions. No matter which type of move you make, have a file or box in which you place every single receipt related to the move. Include gas expenses, lodging, utility shutoffs and connections, and storage fees. Keep all your receipts for packing and shipping household goods. Some of the costs may end up being nondeductible, but save every relocation-related receipt until you know for sure which are eligible for a tax write-off. If you receive a disbursement to defray the cost of your move, you need to keep accurate records to prove how you spent the money. Any amount not used for the move must be reported as income on your income tax form. Alternatively, if you spent more on the move than the disbursement covered, you need proof of the expenses if you want to deduct them for tax purposes. There are many benefits available to service members when they must move due to a PCS. The relocation to your first post of duty is normally covered. A transfer from one post to another post is also covered. Furthermore, when your military service ends, you may be eligible for help relocating from your final post to your next home in the U.S.
Additionally, when you’re deployed or moved to one spot, but your family must move to a different location due to a PCS, you won’t need to pay to move your spouse and/or children separately on your own. All of the relocation expenses for both locations are combined for military and IRS purposes. Your last move must be completed within one year of completing your service, in most cases, to receive relocation assistance. If you’re a part of the military and you desert, are imprisoned, or pass away, your spouse and dependents are eligible for a final PCS-covered move to your induction location, your spouse’s home, or a U.S. location that’s closer than either of these places. There are many protections afforded to service members who are relocated or deployed. Many of these protections keep you safe from predatory lenders, foreclosures, and binding lease agreements. The Servicemembers Civil Relief Act (SCRA) sets rules for how your accounts must be managed by creditors, landlords, and lien-holders. For example, a judge must stay mortgage foreclosure proceedings for a member of the armed services as long as the service member can prove that their military service has prevented them from complying with their mortgage obligations. Banks can’t charge military members more than six percent mortgage interest during their active duty and for a year after their active duty ends. There are other notable protections under SCRA that allow you to focus on your military service without agonizing over your budget. In order to take advantage of some of these benefits when you’re overseas or deployed, consider appointing a specific person or several designated people to have a military power of attorney (POA) to act on your behalf. A POA helps your spouse prepare and submit documentation that needs your signature to be official. A POA can manage household maintenance if you’re deployed far from home. A POA can also help your family relocate when you can’t be there to assist in the move. The POA can be limited in timeframe and scope to fit your schedule and needs. The SCRA rules protect you during your service from some civil trials, taxes, and lease-breaking fees. You can move away from an area for a PCS and deal with your civil obligations and creditor issues at a later time, as long as you or your POA make prompt official responses to time-sensitive letters and court filings. Wheaton World Wide Moving is approved by the General Services Administration to provide professional moving services to members of the armed services. We’re also qualified to support CHAMP (Centralized Household Goods Traffic Management Program) moves. Contact us today to learn about all of the moving services we provide to members of the military who are relocating.